The OLCC announced last week that it intends to expand the number of liquor outlets in the Portland area. Demand for spirits is growing and Portland is woefully underserved in terms of store numbers. There's also the train wreck in Washington to consider. If you didn't see the news release, you can read it here. To summarize, the OLCC is looking to add up to 17 liquor outlets in the Portland area. It currently operates 248 liquor stores across the state, but has only 68 in the metro area. The exploding population here means one store per 26,000 people, the OLCC says. Not nearly enough. They're calling this a "recruitment" and use of the term "outlet" is not accidental. The OLCC is desperate enough to get these places up and running that it is willing to consider "innovative" approaches that would improve convenience for customers. It will be interesting to see what form these outlets take. For those interested in applying for a license, the news release contains a handy cheat sheet of zip codes that are significantly underserved...places with large populations and no liquor outlets. Citizens in Gaston, Fairview, Hillsboro, North Plains, for example, do not have easy access to liquor. In case you're wondering, the OLCC hasn't always been quite as motivated to make liquor readily available. In fact, the agency was once a whole lot more concerned with restricting access to booze. It was a mindset that came straight out of the 1920s. When Prohibition ended in 1933, states were given the power to regulate alcohol sales within their borders. In Oregon, the legislature passed the Liquor Control Act, which created the Oregon Liquor Control Commission and gave the state the exclusive right to sell hard liquor. Beer and wine were to be handled differently. Under the arrangement, liquor was sold via state-run, "green front" grocery stores that were open limited hours, (typically noon to 8:00 p.m.) and days. Taverns, restaurants, bars and clubs were also licensed by the OLCC, but they were not authorized to sell booze. Huh? It's a forgotten detail, but you could not walk into a restaurant or bar and order hard liquor of any kind for many years. Instead, you bought a bottle at a state store, brought it to the establishment and had it checked in. The bartender would label the bottle and pour your drinks from it for a fee. Bar hoppers often drove from bar to bar with open liquor containers. Seriously. Needless to say, the law helped foster vibrant bootlegging. 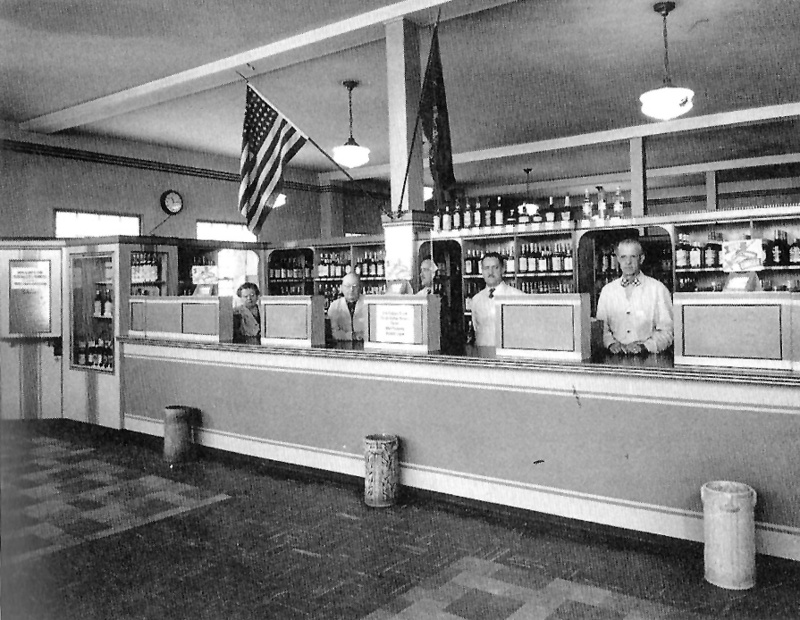 Given the limits of the state stores, it was much easier to buy booze from bootleggers when you needed it. And they were everywhere...cab drivers, bartenders, club owners, waiters, pimps, bell hops, etc. When there's money to be made, entrepreneurs will jump at the chance. State investigators worked undercover to chase down and arrest bootleggers. Almost like Prohibition. The efforts of several agents are nicely documented in: "Enforcing Oregon's State Alcohol Monopoly," in the Spring 2014 issue of the Oregon Historical Quarterly. The exploits of these agents, who functioned with limited resources, are fairly entertaining. After 20 years of inane policy, things changed in 1953, when Oregon voters passed the "liquor-by-the-drink" law. Oregonians could finally walk into a bar or restaurant and order hard liquor. The state maintained it's booze-selling monopoly, but now sold to licensed establishments which then sold drinks to patrons. This put a damper on the bootleg trade and the need to investigate it. It's instructive to consider the evolutionary curve of the OLCC. In the immediate aftermath of Prohibition, it was focused on restricting access to liquor by making the stuff difficult to get. Voters reigned in that effort with the "liquor-by-the-drink law" and the agency has become increasingly interested in making access to booze more convenient in recent times. One can easily argue the OLCC's current efforts are driven by fear and self-preservation. The state does not want to lose its monopoly on liquor sales. It does not want a repeat of the privatization law that passed in Washington state. So the OLCC is working to make consumers happy. And that isn't a bad thing, unless you think Prohibition was a good idea that worked.